India remains the priority destination for Russian arms supplies but some of the biggest failures of Russian defence contractors are also connected with the country. Autumn is traditionally the season for harvesting and drawing preliminary results of the year. The Russian arms industry has little to complain about but there are still some old claims against the country’s suppliers. 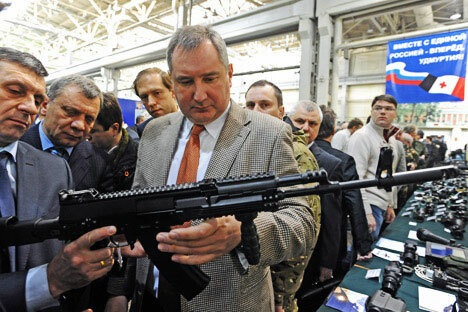 Russia will export more than $13 billion worth of arms in 2012, according to a statement made by Deputy Director of the Federal Service for Military-Technical Cooperation (FSMTC) Konstantin Biryulin at the Aviasvit 2012 aerospace salon in Kyiv in the last week of September. According to the FSMTC, Russia’s military exports totalled $13.2 billion last year. It is a fairly safe bet, then, that this year will set another record for Russian arms exports. “Exports of Russian military equipment exceeded $6.5 billion in the first half of 2012, which is a 14 percent increase from the same period last year,” Russian Technologies State Corporation said in a press release. Who are the main buyers of Russian-made arms then? Of all countries that have arms contracts with the country, India, Venezuela and Vietnam are set to become the leaders in Russian arms imports within the next four years, the Centre for Analysis of World Arms Trade (CAWAT) Director Igor Korotchenko told journalists in late September. Russia’s military exports between 2008 and 2011 amounted to $29.8 billion. The top three customers were India ($8.2 billion), Algeria ($4.7 billion) and China ($3.5 billion). These importers accounted for 55.47 percent of its total exports during that period. “Between 2012 and 2015, India will once again become the number one importer ($14.3 billion), followed by Venezuela ($3.2 billion) instead of Algeria. Vietnam will rank third, with imports of $3.2 billion,” Korotchenko said, citing a revised CAWAT analytical forecast. He explained that the CAWAT rating comprises of 37 countries that are parties to arms supply contracts in 2012–2015. The CAWAT estimated Russia’s military exports to Vietnam at $2.43 billion at the end of August, ranking the country fourth on the list of foreign buyers of Russian arms. In terms of strategic outlook, Korotchenko said that in 2012–2015, the share of the top three importers would reach 62.43 percent of total Russian arms exports, which are forecast at $32.5 billion for that period. Strange as it may seem, China, which has been growing rapidly in all areas, will only rank fourth in terms of Russia’s military exports with $2.8 billion over the next four years, while Syria will rank fifth with $1.6 billion. Korotchenko confirmed once again that, unlike the United States, Russia is oriented towards supplying arms to a limited group of countries, a trend that will only increase over the next four years. He pointed out that the United States remains the world leader in arms sales by a wide margin. “The CAWAT forecasts identifiable US arms exports in 2012 at $25.52 billion, or 36.54 percent of total global exports,” he said. According to CAWAT, France will rank third with $5.6 billion, or 8 percent of worldwide sales. The top five largest arms exporters in 2012 will also include Germany ($4.6 billion, or 6.54 percent) and the UK ($3.2 billion, or 4.64 percent). Russia will therefore clearly remain the world’s number two in terms of arms exports. That said, India still remains the priority destination for Russian arms supplies. In 1996, 2000, and 2007 Russia signed a series of contracts to develop, supply and manufacture under license a total of 230 Sukhoi-30MKI fighter jets in India worth more than $8 billion – the Russian defence industry’s single largest existing export programme. India’s Air Force has already received more than 160 fighters of this type. However, some of the biggest failures of Russian defence contractors are also connected to India. This primarily concerns the long-suffering contract for the sale of the Admiral Gorshkov aircraft carrier to India, renamed the INS Vikramaditya. The Indian Navy was originally supposed to take delivery of the vessel in December 2012. But representatives of Russia’s United Shipbuilding Corporation (USC) confirmed in mid-September that serious propulsion machinery malfunctions had been detected during trials. “Steam boilers are malfunctioning and can’t reach full power,” the USC told journalists.